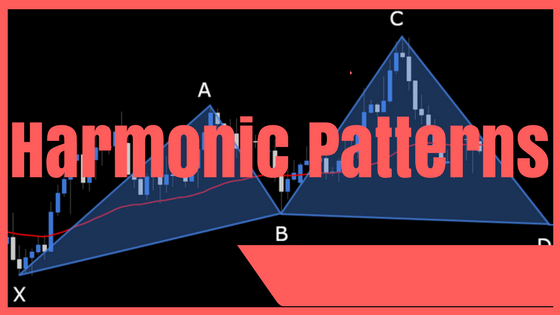 The Gartley “222” pattern is found on in H.M. Gartleys book, Profits in the Stock Market. 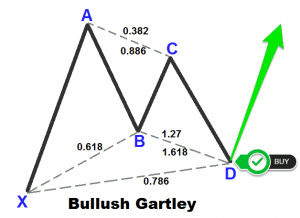 Gartleys are patterns that include the basic ABCD pattern, Gartley chart patterns that lead to the double tops and double bottoms can be great areas for reversals in the market. 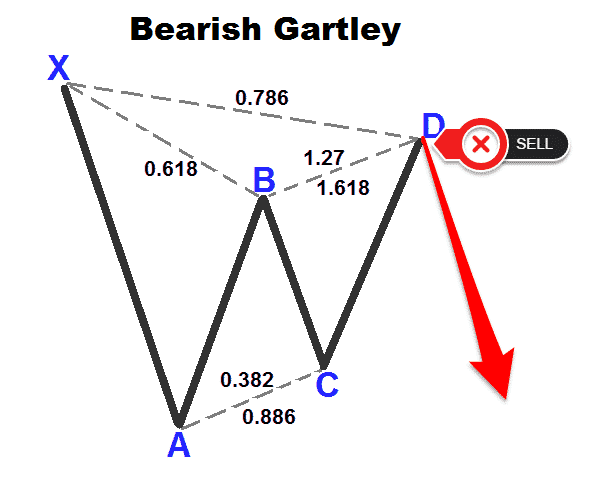 Also, you can use Gartley in directional trades in the direction of the market.These patterns are used to help traders find good entry points to jump in on the overall trend. 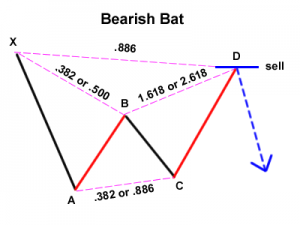 Move AB should be the .618 retracement of move XA. 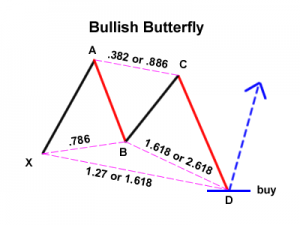 Move BC should be either .382 or .786 retracement of move AB. 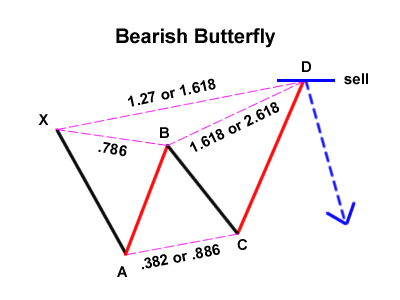 If the retracement of move BC is .382 of move AB, then CD should be 1.272 of move BC. 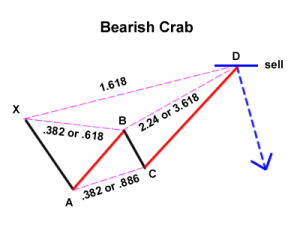 Consequently, if move BC is .786 of move AB, then CD should extend 1.618 of move BC. 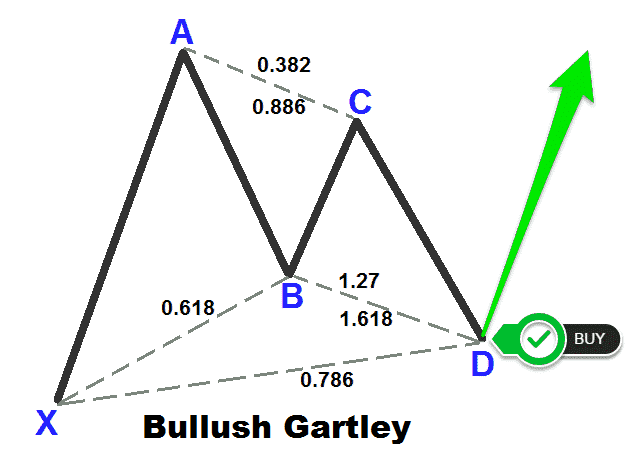 We have a five-points set up with the Gartley pattern labeled XABCD which are following the Fibonacci ratios. The key ratio involved are 38.2%, 61.8%, 78.6% and 100%.The key Fibonacci ratio that makes the Gartley apart from the other harmonic chart patterns is the shallow retracement of the AB swing leg which is only 61.8% of the XA leg. 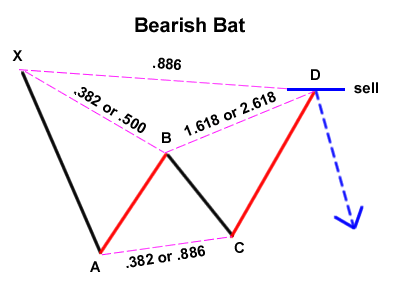 Step #1: Draw Gartley Pattern on the chart the starting point X, which can be any swing high or low point on the chart. 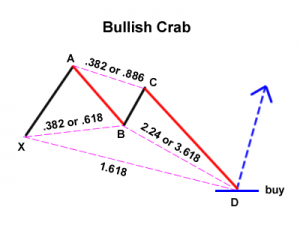 Step #2: Buy at Point D which should satisfy the requirement CD = 1.272 – 1.618 of AB leg. 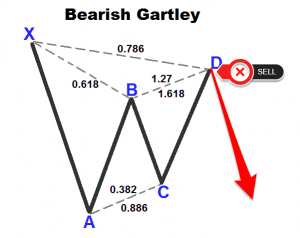 Step #3: Place the Protective Stop Loss below wave X. Move AB should be the .382 or .618 retracement of move XA. CD should be 1.618 extension of move XA. 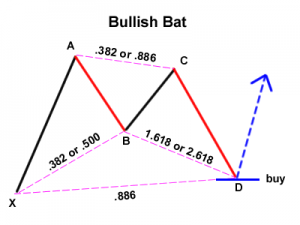 Move AB should be the .382 or .500 retracement of move XA. 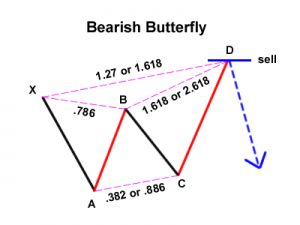 Created by Bryce Gilmore, the perfect Butterfly pattern is defined by the .786 retracement of move AB with respect to move XA. Move AB should be the .786 retracement of move XA. CD should be 1.27 or 1.618 extension of move XA.